A branch of the no-fuss Mexican chain in Dalston. 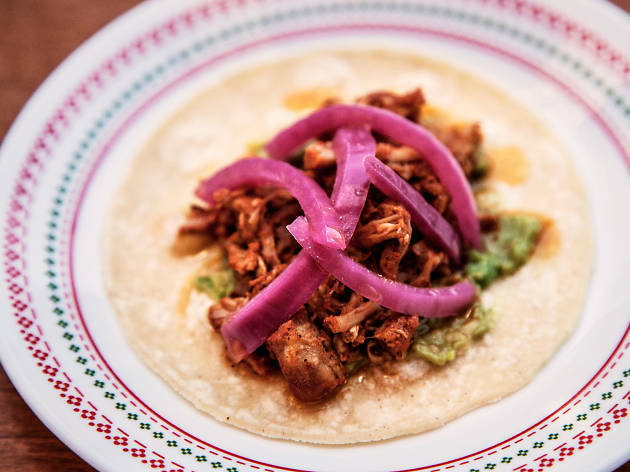 There’s a grand total of 16 items on the menu at this Dalston branch of Del74, a grungy Mexican joint where the motto is ‘keep it simple, keep it real’. On the Friday night I visited, both the vibes and the food were good. The guacamole was nicely tangy and came with a large serve of tortilla chips. The brisket tostadas may have been tricky to eat (their bases so crisp they threatened to collapse on first bite), but they were still spicy and delicious, packed with habanero salsa, sour cream and black beans. Those tostadas also had the crispiest, freshest iceberg lettuce I’ve eaten in a long time – it was weirdly textural and satisfying. 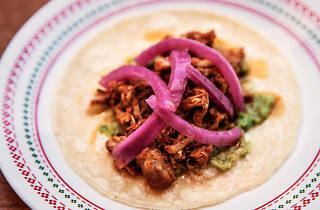 Pork pibil tacos (slow-roasted with achiote spices) were a treat too, topped with bright purple pickled onions that offset the spicing of the meat. There’s plenty to like about Del74. The food is a little basic, sure, but it’s kind of wonderful in its simplicity. It’s also veggie-friendly, with seven out of those 16 menu items being meat-free. 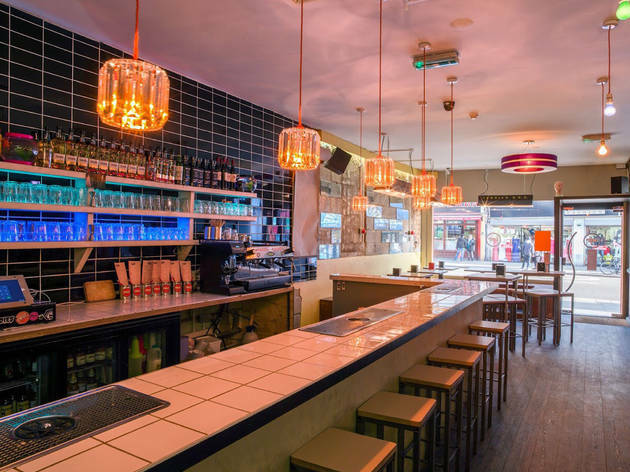 The daily happy hour is a good deal (£2 tacos) and the staff were lovely and approachable. Oh, and this branch (there’s one more, in Clapton) is dog-friendly. Mario the greyhound sat with me the whole time I ate. If that isn’t enough of a reason for you to visit, then I really don’t know what is. Met my friend for a drink after work and we weren't disappointed! We even ended up staying for food which I am so happy about the most delicious vegan cauliflower taco I'eve ever had! The staff are all such fun! Really make a fun evening, thank you! Ive been here for dinner a few times and absolutely love it each time. Such a great atmosphere - the two owners are such great characters and of course food and drink is wonderful!! I recommend the guacamole to start followed by the cauliflower tacos (which are also vegan!! ), cochinita tacos and steak quesadilla! All so tasty. 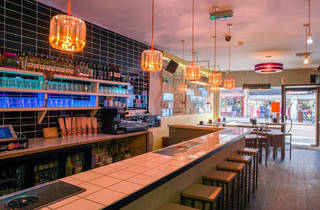 Best Mexican in London and even more amazing hosts! Tacos and margaritas were fantastic and very reasonably priced! I had a cucumber margarita which was just delicious, there were also a few others I will definitely be trying on my return. For food my favourite were the fish tacos and freshly made guacamole! Best margaritas around, good tacos freshly made. Never had any issues with the service in any of my visits! Rudest manager I have ever come across in years of visiting London restaurants. The hospitality business is supposed to be about looking after customers, not wilfully arguing with them. Don't bother going to this place! Much better Mexican food elsewhere anyway. It's bland and thrown together. If only I had read ERnest G s view before wasting my time , turned up with a group of friends had great hope ... what a mistake , waited 20 mins for service , turns out no menu on table so had we not asked could have been waiting forever , ordered , food arrived minus one dish of 6 , thought maybe it was coming ... nope wrong again when we asked where it was .. they thought it had been delivered , as everyone else had finished we decided to just ask for the bill and have it removed rather than wait for one dish , then the manager confirmed the pork had run out and was not even available ???? So your happy tomharge us for something you know you don’t even have in stock ! Then he got miffed and was a right arse hole , a simple sorry would have sufficed , but no they collectively just looked at us like we had molested there family , absolute joke poor service food was average , best part was leaving , seriously do not go to this place , waste of time and money and honestly u can make better food with limited knowledge or ability poor show , poor form AVOiD at all costs !!! !